Hi, I'm Rhona and I'm delighted you are reading this blog. I’ve lived in Caernarfon in North West Wales since 1984. It’s a beautiful part of the UK with long sandy beaches, dramatic mountains and medieval castles. Having grown up in Ascot in Berkshire, I moved north to go to college in Leeds and then back south again to take my first job not far from London. So it was quite a culture shock moving to rural Wales! My husband Eric and I gave up our comfortable home and full-time work to buy a derelict blacksmith’s forge and adjoining cottage. Quite an adventure and I never thought I’d still be here 30 years later! It took years to renovate the stone forge and cottage and turn it into a proper home and transform the overgrown garden/paddock into a fully productive organic plot. Growing our own fruit and vegetables has always been important to us. Eric and I got interested in eating for health years ago and stopped eating meat, eggs and dairy products even before we moved to Wales. It was the best decision we ever made. Having more time and space to devote to my love of growing fresh home produce enabled me to fully develop my green fingers and keep us really healthy! Having a passion for cooking really helps when you have a glut of vegetables. Making the most of every last bean, tomato and courgette has just been a way of life that I've thrived on. What's more, it’s a way of life that offers a sense of satisfaction and well-being that your average ready meal can never provide. These days, avoiding animal fats and processed foods to stay healthy is considered much more normal so, thankfully, we're no longer the "oddities" we once were! Eating this way certainly doesn't mean missing out on fabulous food - which I hope this blog will illustrate! I have always loved baking cakes and puddings and never let the absence of eggs or dairy stop me attempting all manner of treats! Nowadays, I'm equally interested in cutting down on sugar and love to experiment and create healthier options that taste just as good, if not better! If you try any of my recipes, do leave a comment. I'd love to hear from you! 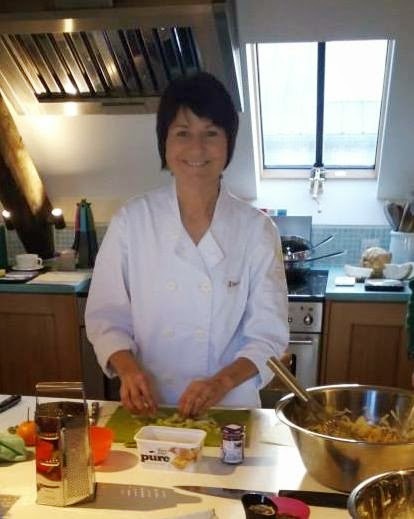 I've been teaching at Bodnant in the Conwy Valley since Autumn 2013 offering a variety of courses throughout the year from the popular New Year Detox in January, Lighten Up for Summer in April, Health on a Plate in August to Deliciously Dairy Free in November. The facilities at the Cookery School are amazing and perfect for teaching small groups of up to 12 people. Lunch is included too and we all sit together in the River Room with it's magnificent views of the Conwy Estuary. A truly fabulous day!